Dual tires have a set of problems all their own. In motion, the inner tire’s temperature increases due to in-board brakes and poor air circulation. This causes increased air pressure, which expands the inner tire’s diameter. As a result, the dual tire configuration is now distorted – the diameters are unequal. 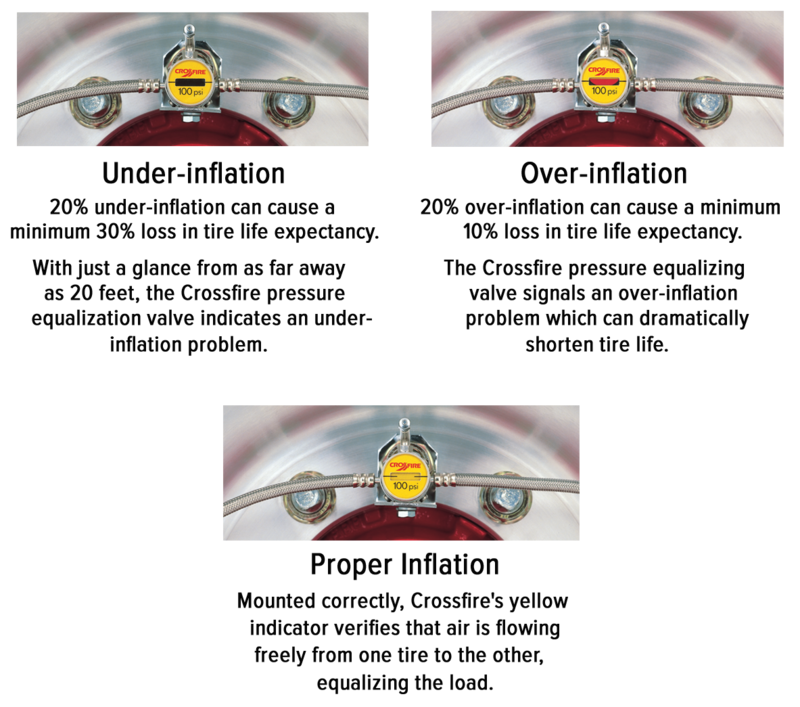 Crossfire is a pressure equalizing and monitoring valve that is mounted between dual tires. 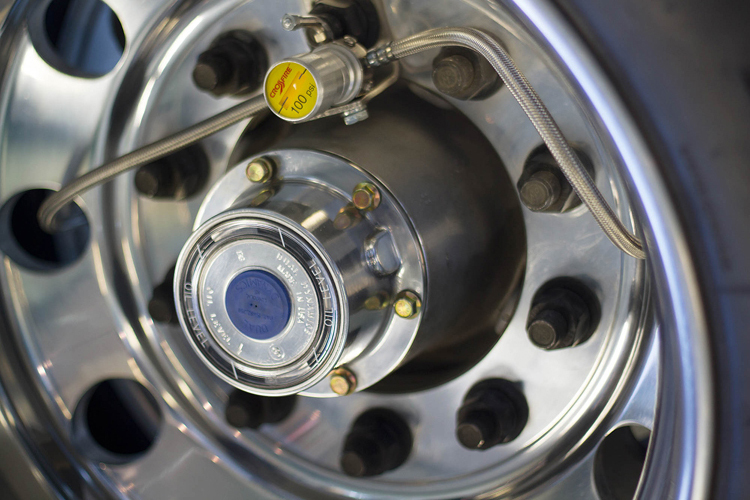 It bolts easily to the lug, hub cap, or drive axle end. Properly mounted, air freely flows from one tire to the other, maintaining equal tire pressure and load distribution. To fully appreciate how the Crossfire system can add 20% or more life to your tires, let’s look at a few problems. The pavement itself causes problems that affect tire wear. Because highways are not perfectly flat, the pavement causes unequal tire loading. The Crossfire system drastically reduces problems created by the road. Every mile you roll with Crossfire, saves you money. Big money. Install the leading dual tire pressure equalization system on the market, and begin saving 20% or more on tire wear. Crossfire has a safety feature that automatically isolates the “good” tire in the event of a blowout. When a blowout occurs, the internal safety valve closes immediately with only a slight loss of pressure to the “good” tire. In slow leak situations, the valve isolates both tires after a pressure drop of approximately 10 P.S.I. From the date of purchase, the Crossfire Dual Tire Pressure Equalization System’s valve is warranted to be free from defects in materials and workmanship for a period of two (2) years. All other parts are warranted for one (1) year. Please refer to complete warranty information included with each Crossfire purchased.